Mr.Tomosan came to my home to do the West bee in artificial dividing. Mr.Tomosan had the nest board and the worker bee to which the royal cell placed. Artificial dividing is to divide the bee before natural dividing is done compulsorily. The West bee does dividing like a Japanese bee. There is often no efficiency of dividing because the time of dividing is irregular though it is also possible to capture divided group and to increase the number of bees. Then, it is efficient to divide the crowd into the bee that tries to do dividing before natural dividing is done. It is called artificial dividing like this to do dividing. I did not know the method of West bee's dividing. Mr.Tomosan was said that he would want me to keep the bee box that he did artificial dividing. I examined about dividing. 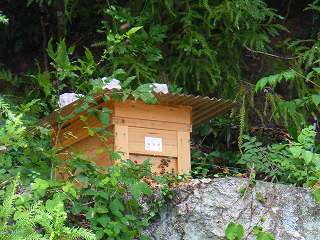 This photograph is a box in the beehive that Mr.Tomosan was brought. It set it up on a big rock of the hill, back of my home. It is a place where sunlight shines well. The way of artificial dividing is as follows. The board of the nest where the stand of an excellent queen was able to be done is put in the box in another nest. This is carried to the remote place (place away at 2km or more) and it puts it. Because the house of Mr.Tomosan and my house are away at about 20km, I do not think that there is a problem of the distance. My house is 200-300m away from the house in the vicinity, and there are a lot of flowers with honey because it is in the mountain. Does the bee grow up well? The number of bee's crowds will have increased when a new queen grows up well, and copulation goes well. It is necessary to save enough honey without squeezing honey to increase dividing crowd's power by winter. It becomes a situation in which it cannot live because it is narrow when honey and the bee become full in the box in bee's nest, and it increases any further. Then, the queen bee lays new queen candidate's egg in the special nest that is called a royal cell. The queen bee in old one takes worker bee's half the number along and says dividing of bee from the nest ahead a little from come out by a new queen bee going out. Divided bees gathers in the tree etc. near the box in the nest for several hours to 2 days and makes bee's ball. It searches for the place where the bee that scouts between those becomes new those who live. The crowd of the bee moves all together for the place when a suitable place is found. To capture a Japanese bee, this bee's ball is put in the bee's house. Putting the bee's house to be near is effective of capture. After the West hive had been brought to Mr.Tomosan, this crowd had received the attack of a yellow vespid for a long time. Then, the cause trap for the vespid that had been made from the PET bottle on July 5 after one week was bound to a tree about 1.5m away from the box in the nest with the wire. Contents of this PET bottle put 100% apple juice and the dish sake in. It was not in reserves though I wanted to use 100% grape juice and white liquor. In general, the mixture of this cause medicine is a grape juice: sake: vinegar: At sugar = 10:3:2: There seem to be a lot of ratios of two. Vespids of about eight a week were able to catch. It is the one that can be unexpectedly caught even if away from the bee's house. It was surprised. Moreover, the rat capture of sticking bought in the hundred-yen store was begun. Because the bee hung, too it stopped it though three vespids hung in about three hours. The West bee makes bee's ball and the heat death of the vespid. 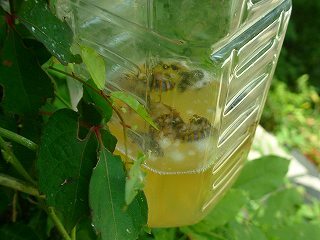 It is said that the West bee doesn't have such a means though a Japanese bee kills the vespid by using heat making bee's ball. However, I saw western bee kill a yellow vespid by using heat. This photograph was taken on the afternoon, July 12, 2009. Is the bee's ball of the kept West hive of blighting under the entrance understood and is made understood? Bee's ball was lost when being go in one hour. There was a corpse of a yellow vespid in the place with this bee's ball. The West bee seems not to be stronger than a Japanese bee in heat according to information from MR.Surounin. This seems to make them called, "Suffocation scrummage", and press a vespine abdomen in the group and arrive at the death from suffocation. It seems to take the death from suffocation about one hour. However, it looks similar when seeing for a moment. 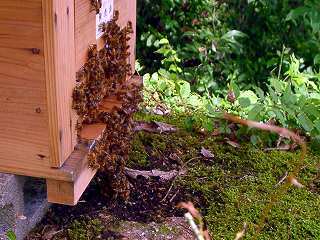 Japanese bee can be a heat death in the group as the wild in Japan as for the vespid. The ability to collect honey is not so high. However, the taste of peculiar honey that differs from the West bee is very popular among the lovers.